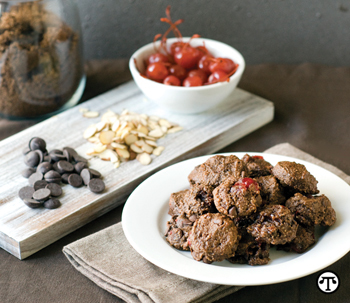 Black Forest Cookies are gluten-, grain- and dairy-free, which makes them a popular treat. (NAPSI)—Chocolate and cherries are the foundation of the classic dessert Black Forest Cake. Now you can enjoy the same flavors in a delicious cookie that can surprisingly be served to family and friends who want gluten-, grain- and dairy-free treats. *Grind your own almond flour: Pulse about 3 cups sliced almonds in food processor until it reaches the consistency of flour. Yield: about 2 1/4 cups almond flour.